- Stop Guessing. Start Doing. The burnt red earth of the Outback, the magnetic attraction of Kakadu and Uluru National Parks and the mystical Aboriginal culture makes the Northern Territory a most unique destination. This is the real Australia in all its raw, unspoilt majesty. The Territory story unfolds through six main destinations, from the tropics of Darwin, Kakadu and Katherine, through to the yellow plains of Tennant Creek and the desert landscapes of Alice Springs and Uluru/Ayers Rock. Be inspired, and start your adventure here now. Find out more about our great deals with up to 25% off selected 4WD and campervans. No trip to the NT is complete without a traditional bush tucker gathering tour with an Aboriginal guide. The Sounds of Silence – a five-star dinner under the stars on a sand dune at Uluru or Sounds of Firelight – provides an exclusive dining experience at Kings Canyon. It's designed for intimacy and romance with no more than ten couples dining on any one night. Exploring the Territory's iconic national parks, including Kakadu, Uluru, Nitmiluk, Litchfield and Watarrka, with their diverse landscapes, are 'must do's on any visit to the NT. To experience the NT's art and culture offering, browse the renowned Aboriginal art galleries in Alice Springs, join a dot painting workshop at Uluru or visit the Tiwi Islands on an art tour and see screenprinters, potters, painters and sculptors at work. For a beach adventure, enjoy a thrilling sport fishing expedition off the coast of remote Arnhem Land or indulge in an eco wilderness resort on the Cobourg Peninsula. Watch the sun set over the water at the Mindil Beach Sunset Markets or take a cruise around Darwin Harbour. If you choose to take part in one of the many wildlife experiences available in NT, you might find yourself enjoying a crocodile cruise, hand-feeding hundreds of fish in Darwin, or meeting desert creatures at the Alice Springs Reptile Centre. Alternatively, you might find yourself on a relaxing sunrise cruise on Yellow Waters amid thousands of birds, or spotting freshwater crocodiles in Katherine Gorge. The population of the Northern Territory is around 250,000. Darwin: 150,000, Alice Springs, 30,000. The Northern Territory has two very distinctive climate zones. The northern region starts the year with warm, tropical rain then moves to warm and sunny days and cool nights mid-year. The end of the year is pre-monsoonal season, which produces amazing lightning storms. Central Australia is semi-arid and experiences Australia’s four typical seasons: summer, autumn, winter and spring. The monsoon rains do not extend this far south so the weather is quite different to the Top End in that there is no tropical rainy season. About one quarter of the Territory's multicultural population is Aboriginal. Darwin is considered Australia’s most culturally diverse city with more than 50 nationalities making up its population. World Heritage listed national parks Kakadu and Uluru-Kata Tjuta, an Aboriginal culture that’s thought to be 50,000 years old, diverse flora and fauna - from the lotus lily to the saltwater crocodile, barramundi fishing, amazing sunsets and tropical lightning displays in the northern region, outback beauty and adventure in Central Australia. Darwin has an international airport and there are domestic airports at Alice Springs, Uluru/Ayers Rock, Katherine and Tennant Creek. The Ghan train links Darwin with Adelaide and stops at Alice Springs and Katherine en route. Darwin is a major cruise port destination. The main towns also offer most transport options: taxis, buses, private hire cars, limousines, light plane charters and coaches and visitors can hire a car in the main towns. Road trains are prevalent on Territory roads - huge trucks that can be the length of 10 cars. Allow at least one kilometre of clear road ahead before overtaking, taking care not to veer off the road. Stock and wildlife - Many sealed and unsealed roads in the Northern Territory are unfenced, so beware of stock and wildlife. These can include birds, cattle, kangaroos and camels. Wildlife is most active early in the morning and late at night, so driving during these times should be avoided. Floods – in the Territory’s northern regions, flooding is common at certain times of year. Do not attempt to cross flooded bridges or causeways unless absolutely sure of the depth and any road damage. Safe Swimming - Swimming in Territory beaches, billabongs and rivers is not recommended due to the presence of crocodiles and Box Jellyfish. This is generally sign-posted, but if you’re not sure, don’t swim. Fatigue – The Territory is a big place, and driving long distances can cause fatigue - one of the most common causes of serious accidents. Stop and rest for 15 minutes at least every two hours when driving. 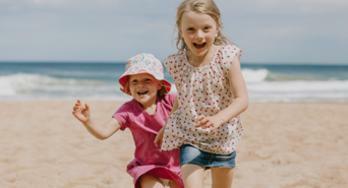 Weather – it can be very warm in the Territory and it’s important to drink plenty of water (at least eight glasses a day, more if active), wear a hat and sunscreen. Speed limits – The default speed limit on open roads in the Northern Territory is 110km/hour, unless otherwise signposted, however travellers should drive at a speed that suits the road, vehicle, weather condition and their driving experience with a maximum of 110 km/h for any of our campervans. Artists - The NT boasts many, many famous Aboriginal artists who sell their work to collectors all over the world, including Albert Namatjira (deceased), Robert Puruntatameri (pottery), John Martin Tipungwuti (scultpure), Jean Babtiste Apuatimi (painting/ screenprinting) and Nina Puruntatameri (painting). Musicians - The NT has produced some exceptional musicians, including Sophie Koh, Jessica Mauboy, Shellie Morris, Yothu Yindi, Djalu Gurruwiwi (didgeridoo), Geoffrey Gurrumul Yunupingu and Sara Storer. Actors - Well known actors coming out of the NT include Tom E Lewis, David Gulpilil and Fiona O’Loughlin (comedian). Writers - Well recognized writers from the NT include, Sara Henderson (deceased), Marlee Ranacher, and Tom Cole. Chefs - Jimmy Shu is a renowned chef and owner of the Hanuman restaurants in both Darwin and Alice Springs. 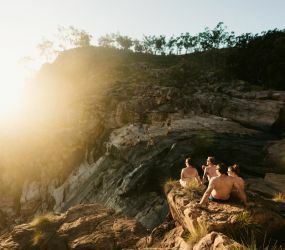 Britz The Explorer's Way Itinerary - See the Outback's rich history for yourself over a 10-day trip that takes in historic Alice Springs, spectacular Katherine Gorge, Litchfield National Park and the Northern Territory's coastal capital of Darwin.